The grandeur and decadence of the old Bon Marché department store in the heart of London’s Brixton, an Edwardian shopping complex modelled on the original, opulent store in Paris, had all but been forgotten when architect Squire and Partners decided it would make the perfect new practice office. The main building, opened in 1877, had been taken over by high-street shops, but its dilapidated annex in Ferndale Road — Toplin House — a later addition built in 1906, lay vacant and had become home to squatters. Having seen almost 50 years as a shopping destination, the building had since been partitioned off into makeshift offices; its Crittall windows, once displaying fine goods, furniture and fashion, were blacked out and barred over, and its ornate ceilings concealed. Squire and Partners saw the potential to sensitively restore and reimagine the block as The Department Store, purchasing Toplin House in 2015 and moving its staff of 220 from its King’s Cross HQ last summer. 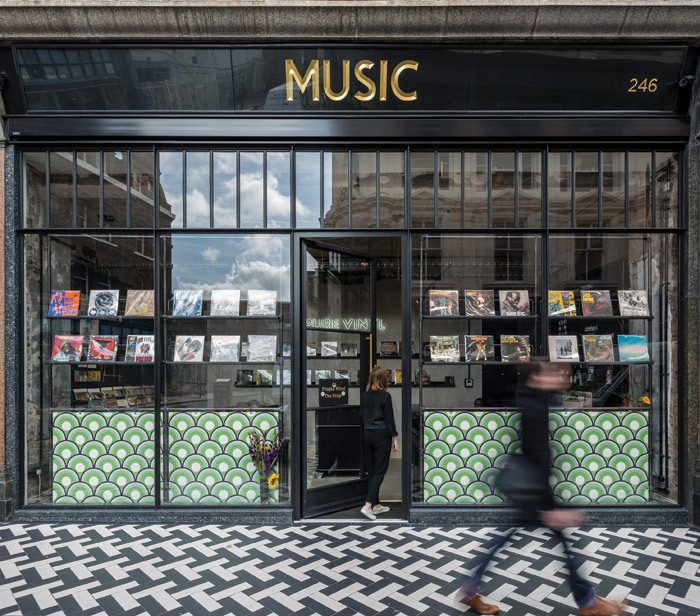 But this was not to be just any old office; in the spirit of the old department store, Squire and Partners wanted to open it up to like-minded creatives and locals. As well as three floors of office space, an events space and rooftop restaurant open to the public at weekends, there’s a new community Post Office, cafe, coffee roastery, restaurant and vinyl shop, all extending along Ferndale Road and enlivening a previously dead frontage. The whole development officially opened in September. Working from historic photographs, the practice stripped back the layers and years of neglect to allow the building’s history to reveal itself. The renovation doesn’t seek to create a polished version of the past, rather a palimpsest of its successive owners — raw, sandblasted brick walls are left exposed, carved out openings reveal their new industrial steelwork, while graffiti from more recent occupants is left in situ. Externally, the old shopfronts have been restored, layers of paint revealing beneath them the original terracotta, marble and brickwork. Monochrome herringbone tiles now mark the entrance. Glimpses of the practice’s ground-floor model workshop can be seen from the outside, giving a hint of the craft and making processes inside. A large reception area, with a huge, 6.5m-long wooden desk, modelled on a haberdashery display, opens on to a new triple-height void, connecting to a basement events space and upstairs to the three workspace floors. Working spaces are divided by a bespoke birch-faced ply furniture system with black linoleum desk tops, developed by Squire and Partners with joinery company Opus Magnum. Exposed services and cables are suspended in metal mesh, pairing the industrial with the original ornate ceiling. Black ply boxes with copper kitchens provide tea points and break-out spaces. Squire and Partners called on various past collaborators to help create interior furnishings and add a new layer of craft to the story. Local designer Eley Kishimoto has created a series of colourful rugs inspired by motifs found in the building, while Danish design brand Carl Hansen revived a pair of Kaare Klint Addition sofas from the archives. 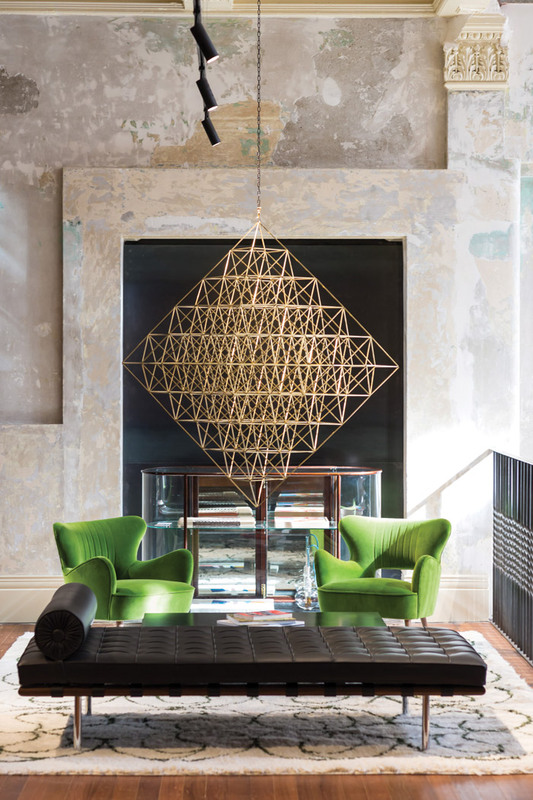 Other collaborations include limited-edition, blown-glass pendant lights by Lasvit in the reception, and ceramics in the meeting rooms created by a practice employee’s company Chu Chu. ‘Suppliers are very excited... that it is almost a showroom for them,’ says Gledstone. Lit up and glowing at night, The Department Store acts as a visual landmark for Brixton. Next, plans are afoot for a second phase, a creative workspace next door, due to complete in 2019.